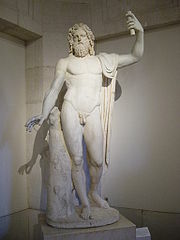 Jupiter, the king of the gods, the great protecting deity, the god of rain, thunder, and lightning. As the largest planet in the solar system, Jupiter is clearly visible and bright in the night sky, a large shining diamond. Jupiter represents expansion, any activity aimed at extending or improving the mind, body, philosophy, or sphere of influence. Jupiter represents our aspiration for wisdom and for a philosophy and moral code to live by. In Roman times, Jupiter was connected to taking oaths and forming treaties. Today Jupiter is still associated with these activities as well as the fields of law, justice, and the ministry. Jupiter is connected to the medical profession, as physicians were regarded as “persons of wisdom” in ancient times. 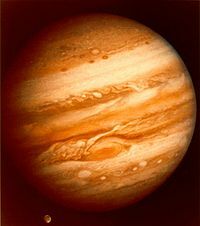 Jupiter represents our faith and optimism, our trust that life is full of meaning and purpose. There is a confidence and buoyancy in people with strong Jupiter energy (think jovial from Jove) and they are interested in adventure and experimentation. Their trust in life allows them to be open to new experiences and this can sometimes become overindulgence or dissipation of energy, a “grass is always greener on the other side of the hill” attitude. How will we define Jupiter as used in astrology for business? Remember, there are three different options in the business use of astrology. The second is reading the chart of a business itself. It is fairly easy to find the date of incorporation of publicly held businesses, and many small business owners can say the date they first opened their doors or made their first sale. The third option is to view the vocations that have been found to be good expressions of certain planetary energies. In the chart of a businessperson, Jupiter indicates the area of life where confidence and optimism brings luck and opportunities. 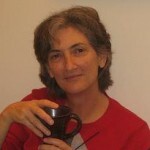 It shows the person’s judgment and discrimination, or lack thereof, and how practical they are in decision-making. Jupiter indicates inspiration and the tendency toward expansion into new territories. It can also indicate whether international business opportunities are a focus. Jupiter can indicate the presence of a wise advisor, such as a father or grandfather who provides consistent support. The condition of Jupiter tells about the person’s openness to new opportunities and experiences, and the business philosophy regarding continuing education and training. It indicates their level of benevolence and generosity toward employees and colleagues, and whether the person is reasonably openhanded or a spendthrift. Like the other planets, when we look at Jupiter in the chart of a business, we take the essential meanings of Jupiter in a personal chart and combine them with the meanings of Jupiter in a mundane chart. A business is an entity in that it has a birth, a life cycle, and an end, and it has meaning and purpose like any other being. It is like a child of a person’s imagination and desire. But it’s also impersonal, in that it doesn’t carry its own conscious evolvement even though it passes through phases and cycles like everything else on earth. In this way it is more like a mundane chart and the meanings from that branch of astrology apply. In a business chart, Jupiter describes the moral standards of the company and its advisors or board of directors. As in the businessperson’s chart, Jupiter shows the likely areas for opportunity and expansion. It describes legal and international affairs. It shows the company’s approach to goal-setting and strategic planning, and whether learning and experimentation are encouraged in the culture. The general expectation for financial success can be seen from the placement of Jupiter. Some vocations associated with Jupiter include publishing, law, and philosophy. Jupiter also is associated with all forms of higher education, both as professor and student. The ministry falls under the rulership of Jupiter and vocations associated with international travel are also related to Jupiter. Can you form the link between the vocational expression and the other descriptions? The essential energy of Jupiter takes slightly different but related forms in the different expressions. This entry was posted on Wednesday, August 5th, 2009 and is filed under Astro4Business Basics, Introduction to Astrology for Business, The Planets. You can follow any responses to this entry through RSS 2.0. You can leave a response, or trackback from your own site.